I am back in Singapore for a short visit, and making good some of my promises to various good friends, including going to the Marina Bay Sands (MBS) Chocolate Buffet, which is now re-branded as the Cheese and Chocolate Bar. 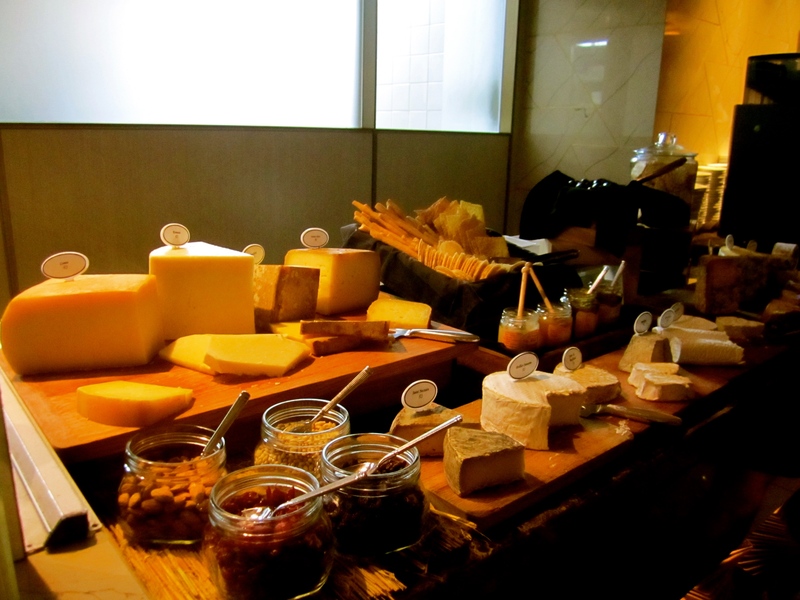 Situated on the 55th level of the MBS complex, a key draw of the Cheese and Chocolate Bar is the view. Arrive early, and ask the seating host to give you a city (or if you prefer, river) view of Singapore. I’m a city-scape person, so it was really a treat for me to enjoy my meal with a view of the Singapore skyline and waterfront. Pairing cheese and chocolate is quite a work of genius. The savory and sweet do complement each other, and gives you the ability to keep going for a little while. Their cheese selection had some interesting flavor profiles, and I wish I knew enough about cheese to contribute to the conversation, but I don’t. So, all I shall mention is a rather pedestrian – it was nice. Another aspect of the MBS Cheese and Chocolate Bar which I truly appreciated, is their inclusion of (unlimited) coffee and tea with the price. Their espresso machine is nothing special, but hey, a latte is a latte, and the bitterness of coffee goes well with chocolates. They also offer TWG teas, which was a nice way to cleanse the palate after a few servings of chocolate. Caffeine at the Fullerton buffet has to be purchased separately. 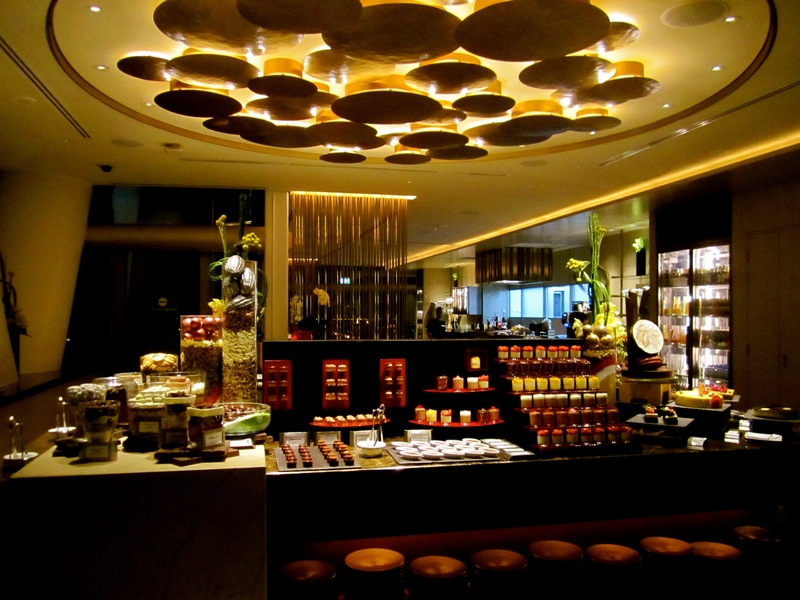 Quality-wise, I’d say that the chocolates at Fullerton Hotel’s chocolate buffet are somewhat superior in quality. In particular, I actually liked the hot chocolate tasting station at Fullerton Hotel, which featured some high quality chocolates. The chocolate spread at MBS Cheese and Chocolate Bar had probably about 20+ items (sorry, but putting out Snickers bars, Milky Way bars, and M&Ms don’t count – but perhaps might be good for the kids), and I did not have anything particularly memorable. P.S. For those who’re really into food photos, be aware that it’s really dim, so bring a flash or something, if you really want to take good food photos. Bottomline? Overall, it was a nice experience, given the view, and the mix of cheese and chocolate, alongside with the generous provision of caffeine. But I probably wouldn’t go there just for the chocolates.